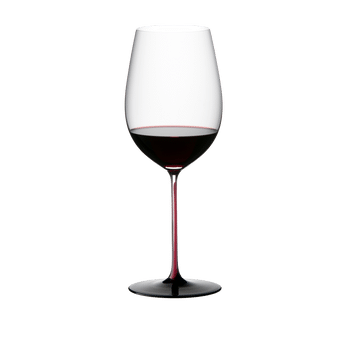 The unadorned handmade Riesling Grand Cru glass of the beautiful glass collection Sommeliers Black Series is charactarised by a red stem and a black base. The shape of the glass best supports floral white wines – aroma and taste are dominated by fermented grape juice and the flavor of yeast. Sommeliers Black Series can be used as a drinking vessel but is primary considered as an object of beauty gracing the homes of wine collectors. All RIEDEL glasses are dishwasher safe. SOMMELIERS, the world’s first wine-friendly glass series, presents itself in new attire. SOMMELIERS BLACK SERIES COLLECTOR'S EDITION is made from black crystal glass. Adding cobalt and manganese turns the crystal glass black. This cools much quicker than transparent glass, posing an additional challenge for the glass makers. The manufacturing process is further complicated because the R-Black Series Collector's Edition has a red glass string overlaid with clear glass. Although the Black Series can obviously be used as a drinking glass, we see it more as a particularly beautiful design object, which highlights the unique styling and proportions of the Sommeliers series. The original Sommeliers series comprised 10 shapes. The shapes were determined by the age of the wine and the various wine qualities. The current glass series was adapted under the aegis of Georg J. RIEDEL, with special glass shapes being developed in workshops. Highly experienced wine experts, such as Robert Parker, or winemakers, such as Gaja, Guigal and Robert Mondavi, contributed their knowledge to help fine-tune the RIEDEL glass shapes. The Sommeliers shapes have since become a benchmark for the industry and are now copied by many other glass manufacturers.